The Genome Institute at WashU has gone by a few different names over the years… previously we were “The Genome Center” and before that, during the Human Genome Project, we were “The Genome Sequencing Center.” Now the name changes but for a good reason. 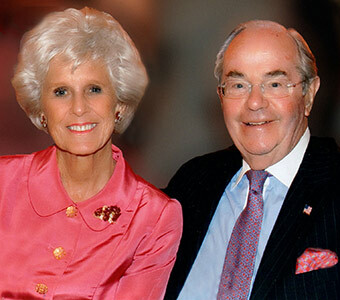 As announced today in the WashU Record, The Genome Institute has received a $25 million endowment from James and Elizabeth McDonnell. This gift will support our research on the genetic basis of cancer, diabetes, Alzheimer’s, and other diseases with the goal of improving diagnosis and treatment. With it comes a new name: The Elizabeth H. and James S. McDonnell Genome Institute. Less formally but more practically speaking, we’ll probably be called the McDonnell Genome Institute, or MGI. I happened to grow up in the St. Louis area, where the name “McDonnell” is legendary. James S. McDonnell (our new patron’s father) founded McDonnell Aircraft in 1939. Later it became the McDonnell Douglas Corporation, a household name in St. Louis. James S. McDonnell III began his career in 1963 as an aerodynamics engineer at his father’s firm, became vice president of the company in 1973, and retired in 1991. He remained a director for the company until its merger with Boeing in 1997. The McDonnell family has given generously to many organizations for decades. Their legacy in the field of genetics began in the 60s, with gifts that established the McDonnell Medical Sciences building on our campus and endowed the James S. McDonnell Professorship of Genetics. In 1975, another gift from the McDonnell family established the Department of Genetics, which was one of the first in the country. We published the first complete genome of a tumor in 2008 and have applied next-gen sequencing technologies to breast cancer, glioblastoma, ovarian cancer, leukemia, and other cancers. Much of that is through the Cancer Genome Atlas (TCGA), a national effort to characterize the genomes of common cancer types. Recently, we partnered with the Siteman Cancer Center to establish the Genomics Tumor Board, which aims to apply rapid-turnaround sequencing to guide diagnosis and treatment of cancer patients. In the last few years we’ve also devoted considerable efforts to understanding the genetic basis of common diseases. Last year, for example, we identified a rare coding variant in complement 3 associated with age-related macular degeneration, which is the leading cause of vision loss in adults. For the past two years, we’ve been part of the Alzheimer’s Disease Sequencing Project (ADSP), a $50 million effort to identify new genomic variants contributing to late-onset Alzheimer’s Disease. We’re also working with Nelson Freimer (UCLA), Mike Boehnke (UM), Aarno Palotie (MGH), and other collaborators to sequence the exomes of 10,000 individuals from Finnish populations in a search for new variants linked to cardiovascular and metabolic traits. We’ve also tackled a number of diseases that affect children. A few years ago, we teamed up with St. Jude Children’s Research Hospital for the Pediatric Cancer Genome Project (PCGP), which has sequenced the genomes of more than 600 pediatric cancer patients. A particular focus of that effort is neuroblastoma, a form of brain cancer that took the life of the McDonnells’ 2-year-old daughter, Peggy. We’re also working with F. Sessions Cole (St. Louis Children’s Hospital) on the genomics of rare pediatric diseases. I’m thrilled that we’ve partnered with them and the Department of Pathology to start a Genomics Pediatric Board which will apply panel, exome, and whole genome sequencing to children afflicted with severe genetic diseases and their family members. MGI has benefited immensely from early adoption of new sequencing technologies. With the installation of the new Illumina HiSeq X Ten sequencing system, we’ll have the capability to sequence whole genomes at unprecedented speed and relatively low cost. We’re looking for new collaborators! If you have a (human) cohort and are interested in whole genome sequencing, MGI would like to collaborate. Please contact me (dkoboldt [at] genome.wustl.edu) and I’ll put you in touch with the right people here.